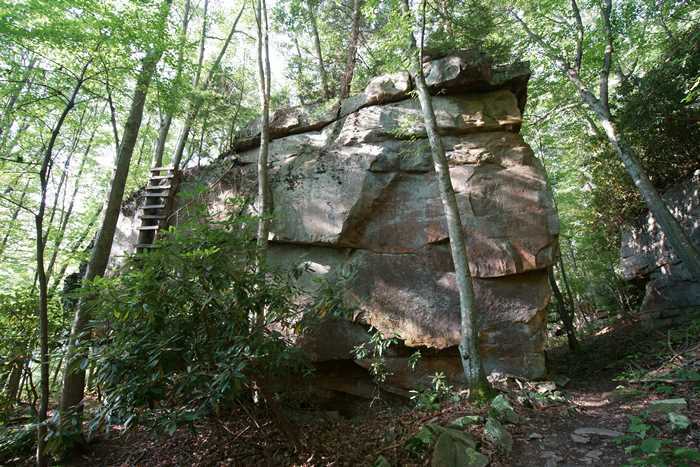 A big, unusual rock is buried deep in the woods near Beckley, West Virginia, but you don’t have to hike very far to check it out. It’s known as Shiprock, and the Shiprock Trail has recently become a popular place to escape into the forest and, perhaps, allow your imagination to run wild. From Interstate 64, take exit 124, then continue onto the East Beckley Bypass (do not turn onto US 19). Turn right on YMCA drive, then make another right at the soccer fields. Park near the beach volleyball court on the far side of the complex. 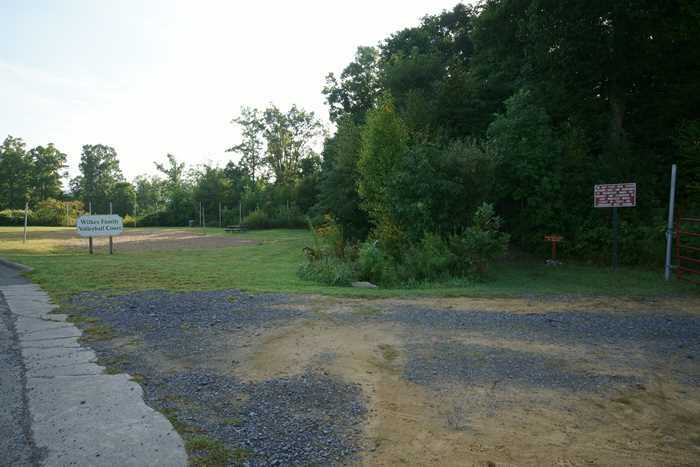 The trailhead is near the volleyball court — with an alternate trailhead just up the hill slightly. Even though I had lived in the Beckley area for years, I had never heard of Shiprock Trail. 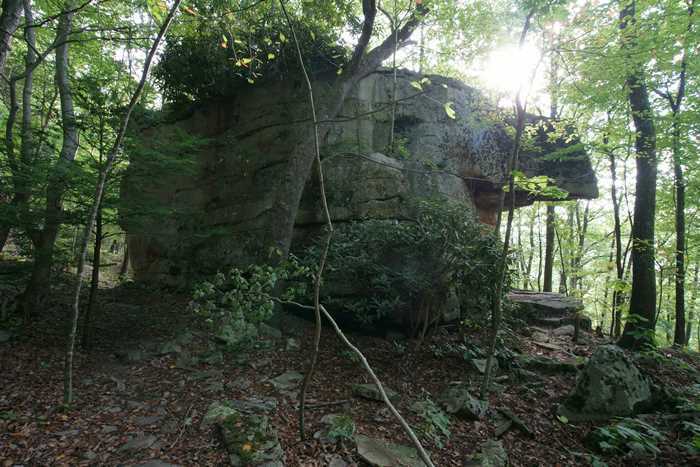 People have known about it, and visited it, for a century or more, according to one website, but it was only recently that volunteers blazed an easy trail out to the rock, and it grew in popularity. Finding the trail is just a bit tricky. You need to look for the volleyball court — which is just a sand pit, and not nearly as formal as the soccer fields nearby. The trail is near the volleyball court. 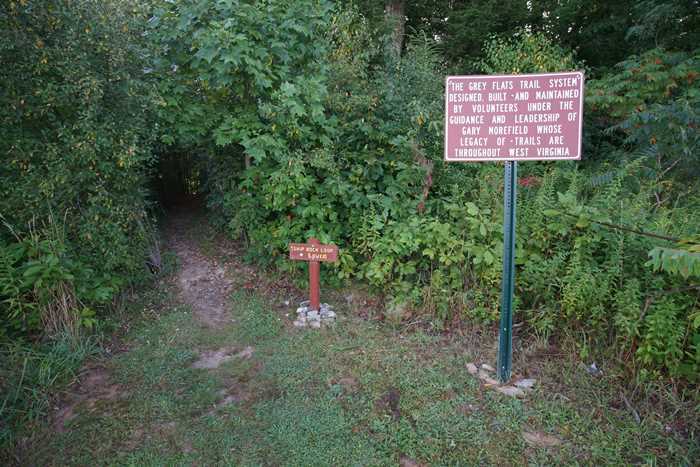 Just look for this big red sign, with a much smaller trailhead sign next to it, and an ominous hole in the brush that looks like a portal to a magical woodland parallel universe. As I plunged into the woods, I encountered a lot of spider webs. 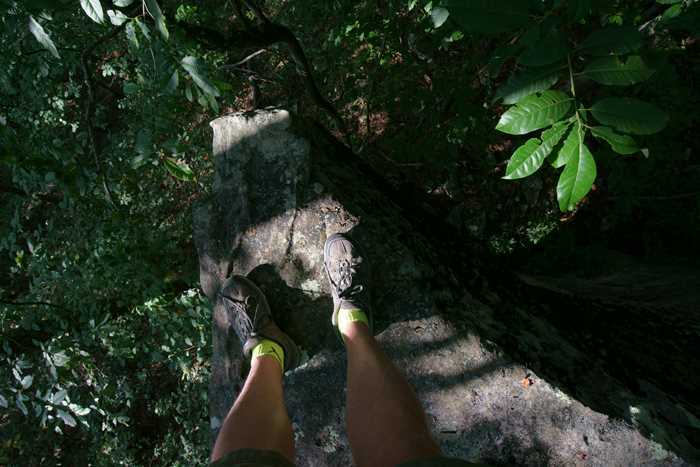 I must have been the first person to hike the trail that day, or the spiders are pretty quick at rebuilding. Either way, the lesson is clear: if you’re hiking with friends, let them go ahead of you. It’s a fairly easy stroll through the woods as you make your way down to the Shiprock. 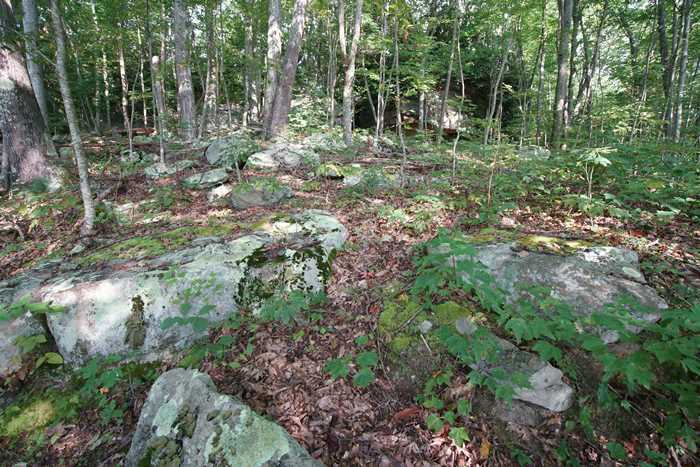 You’ll see some other big boulders scattered along the ground, but the main attraction might elude you at first. It’s there, it’s just camouflaged. When you get to a junction in the trail (there’s another branch that provides a longer loop back to the soccer fields), you should look around very carefully, because the Shiprock is definitely there, and if you go any further, you’ll miss it. Like searching for Waldo, all of a sudden you’ll see it and wonder how you could have missed it. When I saw it, I thought, okay that’s nice, but it wasn’t until I noticed the ladder that I figured out why it was worth the hike. See it there, on the side of the rock? 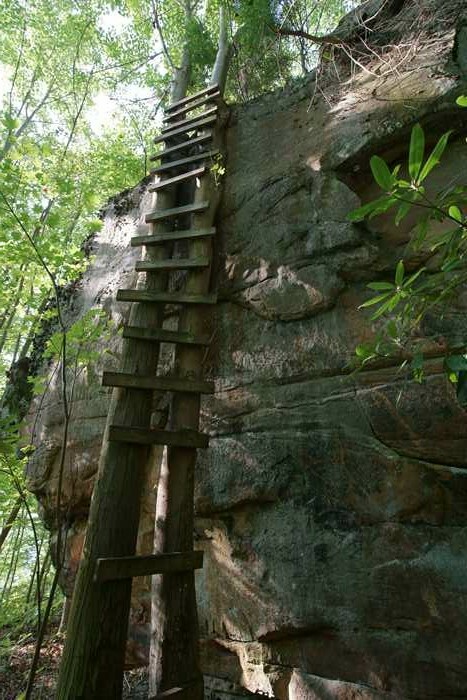 That ladder is made up of two trees, with some boards nailed in between them. 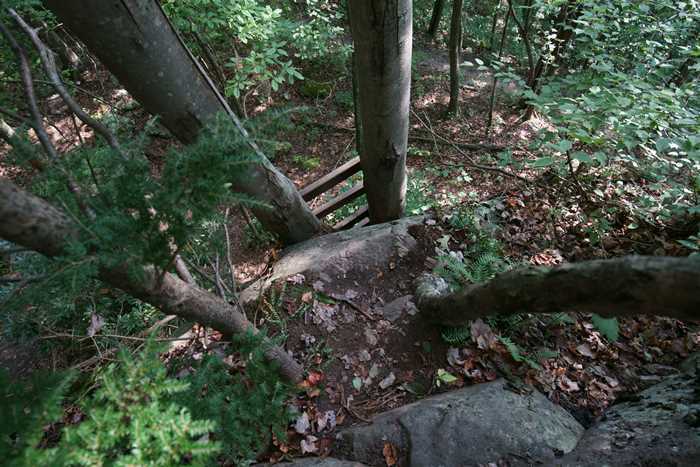 It looks precarious, but it’s obvious that those boards have been there for decades since the trees have grown around them. I figured that was a sign that they were pretty sturdy, so I gave it a try. … and out to the edge. And after that, you have to climb down, complete the loop back to the parking area, and re-enter the real, adult world. It doesn’t take long to hike the Shiprock Trail (I spent less than an hour here), and it’s only about a mile round-trip. It’s a fun escape from the real world, thanks to the efforts of volunteers to maintain it. So, go enjoy it!